Preheat oven to 350°F. Then bake phyllo shells for 10 minutes until crisp and brown. Heat olive oil and butter over medium heat. Sauté shallots until soft and translucent, about 3 minutes. Add mushrooms and cook until they release their juices, about 4 minutes. Add wine and cook down until mushroom mixture is almost dry, about 5 minutes. Sprinkle mushrooms with flour and cook for another minute. Add Silk and simmer for 3 minutes. Add chopped spinach and continue to cook until spinach is wilted and bright green, and filling has thickened (1-2 minutes). 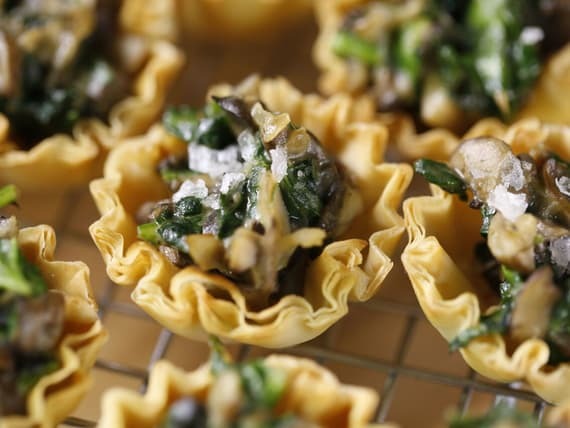 Spoon mixture into mini shells, filling to top. Top with Parmesan, if using. If using flaked sea salt, wait until fillo cups have baked to sprinkle.